Academics from across a variety of fashion disciplines at LCF will come together to discuss Jean Paul Gaultier, his work and his legacy. The showcase featured eight compact and idea-packed presentations, celebrating and exploring ideas and issues raised by many of the works featured in The Barbican’s The Fashion World of Jean Paul Gaultier from the Sidewalk to the Catwalk and the Fashion Space Gallery’s Jean Paul Gaultier: Be My Guest. 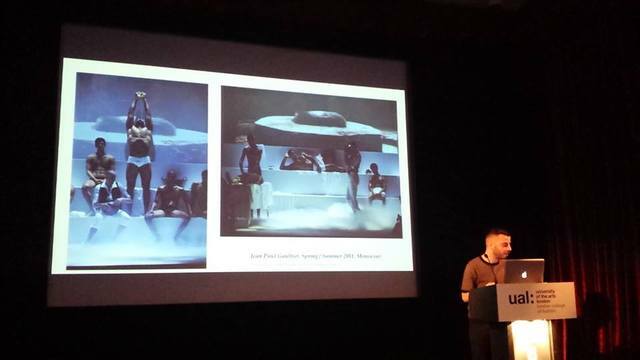 Pamela Church Gibson, course leader of MA Fashion and Film, presented “Gaultier and Cinema”, exploring Gaultier’s design work for cinema and his work with performers from the music industry. She was joined by fashion experts from across design, cultural and historical studies, media and communication, and branding and retail, who will encounter topics within and surrounding Gaultier’s work, including: Orientalism, masculinities, comics, queer perspective, the luxury leather industry, Russian constructivism and brand personality.